Despite SOF aircrews having recently taken part in an actual SOF insertion onto a ship where SOF troops captured illegal immigrants holding the crew of a ship captive, UK Special Forces aircrew have just completed yet another major week-long SF exercise called Faraday Field. Air assets started to assemble on a recent Sunday at the remote Altcar range – located on the UK’s west coast and where both regular and reserve troops, plus cadets, fire some two million rounds a year. First to arrive were Merlin helicopters from the Royal Naval Air Station Yeovilton. 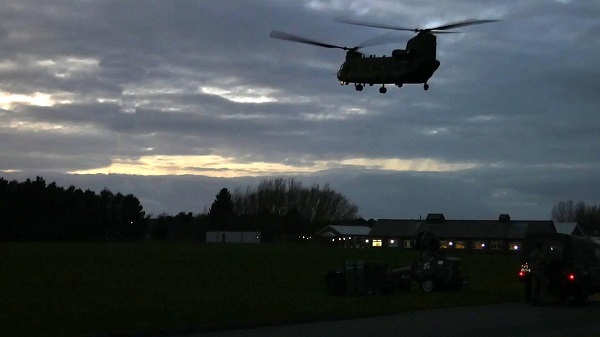 These were followed by Chinooks from RAF Odiham and then Royal Navy Wildcat helicopters from RNAS Yeovilton. Once established on camp, and following a meal and briefing, the UK Joint Special Forces Aviation Wing aircrews commenced week-long night time insertion sorties, out to both rigs and shipping, located in the nearby Morecambe Bay – the second largest gas field in the UK. The sorties consisted of the force inserting SOF troops by fast roping from Chinooks, whilst protected by both Wildcat and Merlin helicopters. Plus, a Merlin HM.1 providing ISTAR, Radar coverage and Search and Rescue duties. To compensate for the disruption caused to local residents during Faraday Field, created by noise from the helicopters departing en-mass each night, the range held a one-hour public open session on the exercises last day. Residents were able to view a number of the helicopters and then watch them depart to their home bases. It was an opportunity that was gratefully received by those who took advantage of the occasion. 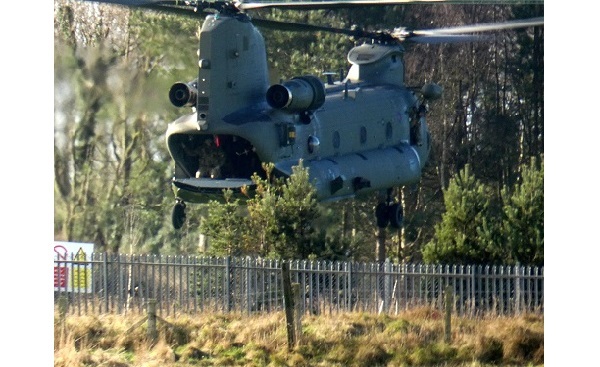 It also somewhat compensated for the actions of one or two members of the range’s security team, who during the week tried to stop residents and enthusiasts photographing the helicopters whilst they were standing on public footpaths, located outside the range boundary.